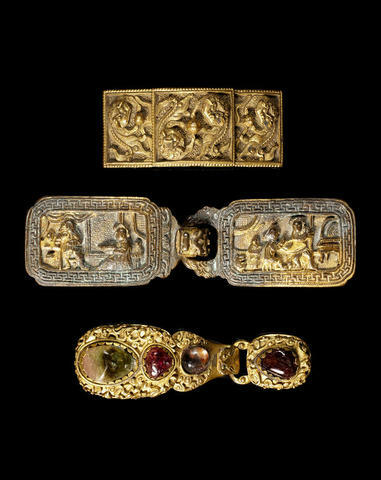 Three gilt-bronze sectional belt clasps, 19th century. Estimate £800 – 1,200 (1,100 – 1,600). Photo Bonhams. One with rectangular panels cast in relief with scenes of figures on terraces, with dragon head hook; one inset with a variety of hardstones, cast in relief with bats amongst clouds scrolls; the third with a sliding section, cast with three panels of Buddhist lions playing with brocade balls. The largest 13.7cm (5.3/8in) long. (3). 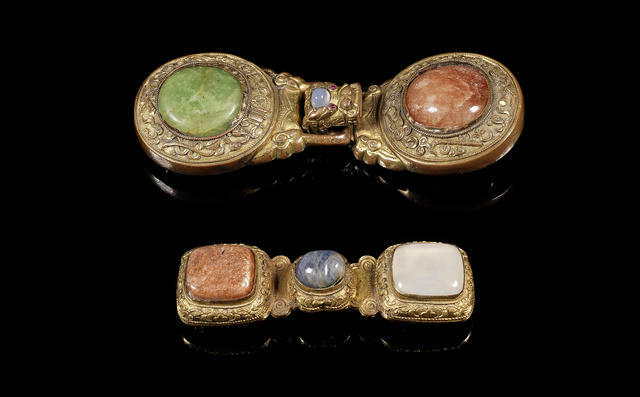 Two hardstone-inlaid gilt belt buckles, late Qing Dynasty. Estimate £800 – 1,200 (1,100 – 1,600). Photo Bonhams. One mounted with rough cut quartz and green hardstone each surrounded by four of the Eight Daoist Emblems in gilt bronze repoussé, the clasp formed as a mythical beast’s head set with moonstone and red jewelled eyes; the other with gilt bronze scrolled bases mounted with sunstone and sapphire on one side and pale green hardstone on the other. The larger 15cm (6in) long (4). 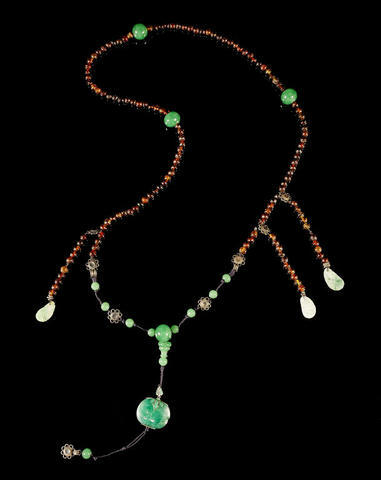 An amber, green glass and jadeite necklace, chao zhu, 19th or 20th century. Estimate £1,000 – 1,500 (€1,300 – 2,000). Photo Bonhams. LONDON.- Following the great success of last year’s “Of Royal and Noble Descent” sale, Sotheby’s London will present a further selection of 250 exceptional royal and aristocratic heirlooms on Tuesday, 24 February 2015. 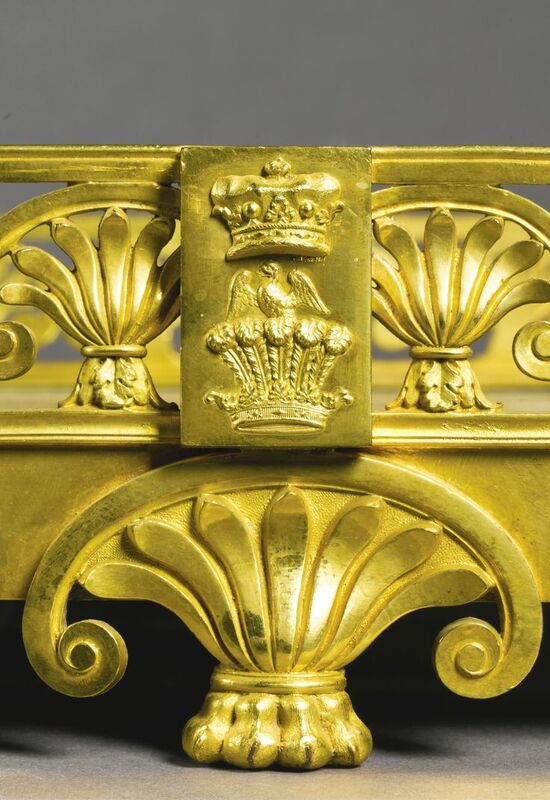 Covering centuries of history and originating from the four corners of the world, including China, Latin America, Saudi Arabia and Europe, this sensational group of furniture, paintings and precious objects not only boasts royal and noble provenance, but also exemplifies the creativity and craftsmanship of their era. A rare set of 24 portraits of Roman emperors and their consorts, in classical poses, dressed in armour and draped clothing, together with the personification of Rome. After Tiziano Vecellio, called Titian, first half of 18th century Est. £80,000-120,000 (€102,000-153,000). Photo Sotheby’s. This series of panels painted on grey marble derive from a set of 24 prints by the Flemish 16th century engraver Aegidius Sadeler II, of which the 12 portraits of the emperors were done after paintings by Titian. 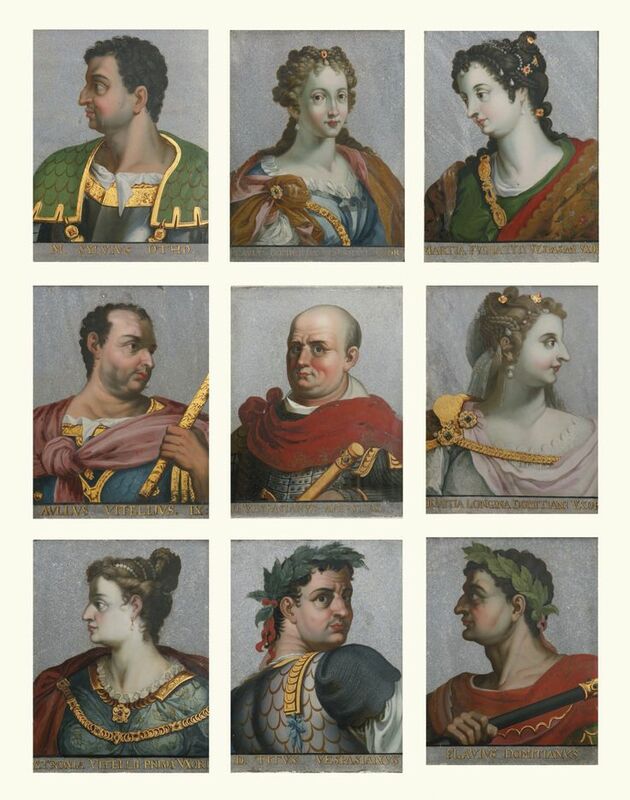 Portrait series showing Roman emperors and empresses were in high demand from the late 17th century onwards, mainly due to the increasing popularity of the ‘Grand Tour’ and these are particularly rare for being painted on marble. Prince Heinrich of Prussia’s Silver Model of The Warship Kaiser Friedrich III. M. Fadderjahn (Silberwarenfabrik), Berlin, circa 1903. Est. £60,000-100,000 (€76,500-128,000). Photo Sotheby’s. Made by the Berlin maker M. Fadderjahn circa 1903, this impressive model was presented to Prince Heinrich of Prussia (1862-1929), Inspector-General of the Navy and younger brother of German Emperor William II. It is a model of the warship SMS KAISER FRIEDRICH III which was launched in 1896 by the Emperor in person, in the name of his father, and was a lead ship of the Imperial fleet. 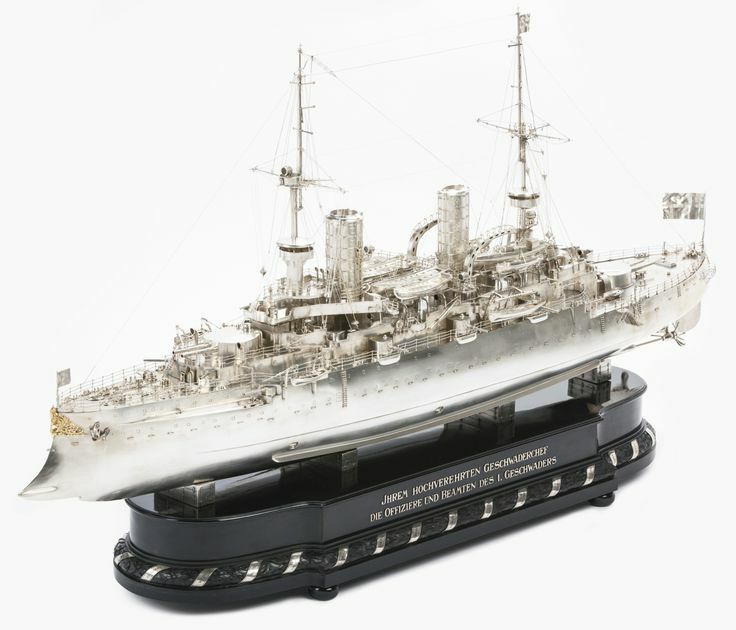 Elaborate silver ship models like the present one were very popular as prestigious gifts for the German Empire’s high nobility and the high military command. However, only a few pieces have survived to this day. 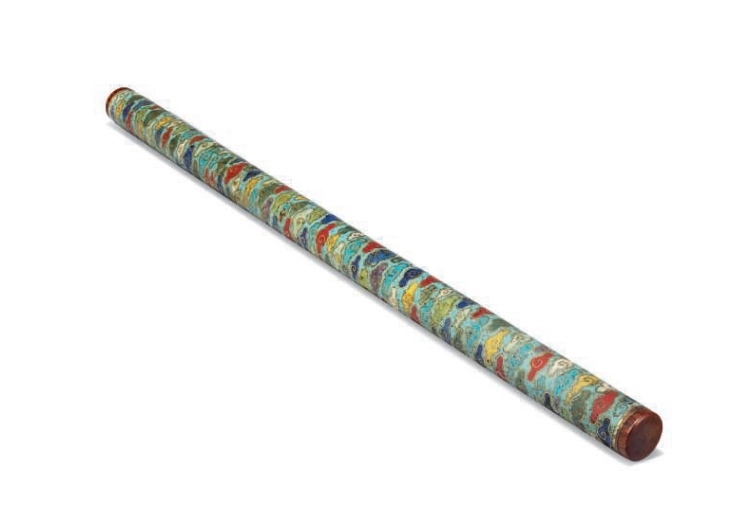 A wood ruyi scepter, Qing Dynasty, Guangxu Period. Est. £30,000-50,000 (€38,300-64,000). Photo Sotheby’s. 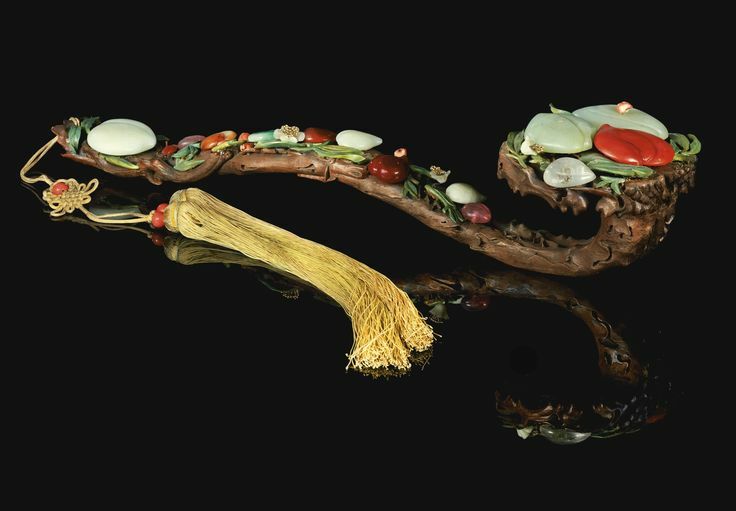 This hardstone, coral and ivory-inlaid wood ruyi sceptre is accompanied by a shaped textile support bearing an inscription meaning “Presented by Gang Yi (1837-1900), who was the Governor of Guangdong during Guangxu period”. According to family tradition, this exquisite piece was acquired by a member of the Brockholst Livingston family (relative of the famous American Revolutionary War officer Henry Brockholst Livingston) during a visit to China in 1863 and thence by descent to the present owner, a German Count. 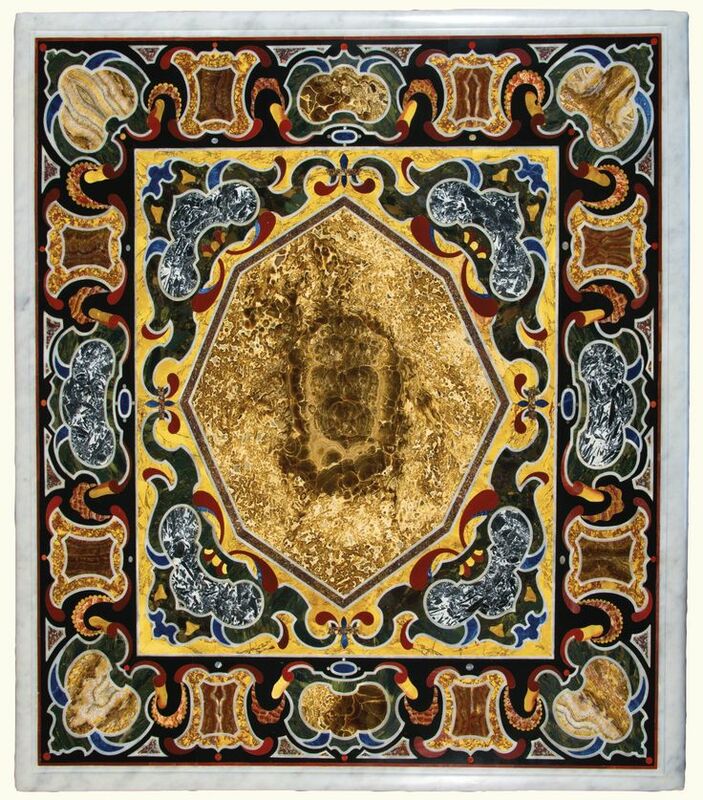 A Renaissance style antique marble inlaid table top 2007-2012, executed by the Opificio delle Pietre Dure, Florence with antique stones and marble. Est. £20,000-30,000 (€25,500-38,300). This exquisite table top was produced over the course of five years by the Opificio delle Pietre Dure, heir to a workshop established by Grand Duke Ferdinando I de Medici in Florence in 1588 and renowned for its works of art made of semiprecious stones and marbles. Inspired by Antiquity and often using Imperial Roman marbles, the workshop’s extraordinary production of table tops, cabinets and decorative panels were highly sought after by European royalty and aristocracy in the 16th-18th centuries. The present table top was inspired by a late 16th century top, known as the “Medici Treasury”, today in the Museo degli Argenti, Florence. Exclusively made using traditional tools and technique, it features stones from the actual Medicean collection of antique marble and stones, which the Florentine patrons brought over from Rome in large quantities as prize possessions. The Archduke Franz Ferdinand hunting sword by Stanislaus Striberny, circa 1890, Vienna. Est. £8,000-12,000 (€10,200-15,300). Photo Sotheby’s. In 1892, Archudke Franz Ferdinand of Austria-Este, heir to the AustroHungarian Empire, embarked on an around the world journey. Testament to his travel to Nepal and his great passion for hunting is a sword he gave in 1893 to Prem Shamsher Rana, nephew of the Maharaja of Lambjang and Kaski, Prime Minister of Nepal. 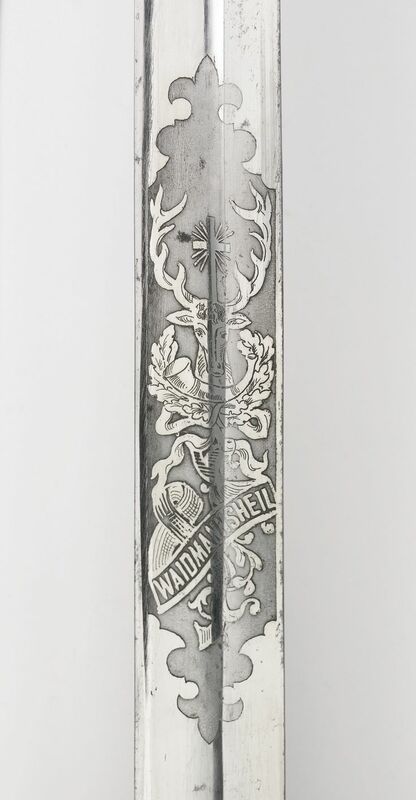 Made in Vienna by Stanislaus Striberny, circa 1890, this sword is mentioned in the Archduke’s detailed travel diaries. A photograph of Prem Shamsher Rana proudly holding the received gift still exists in the collections of the Weltmuseum in Vienna. The sale also comprises a group of ten royal and imperial presentation boxes, led by jewelled pieces featuring the cyphers of Napoleon III and Mexican Emperor Maximilian. 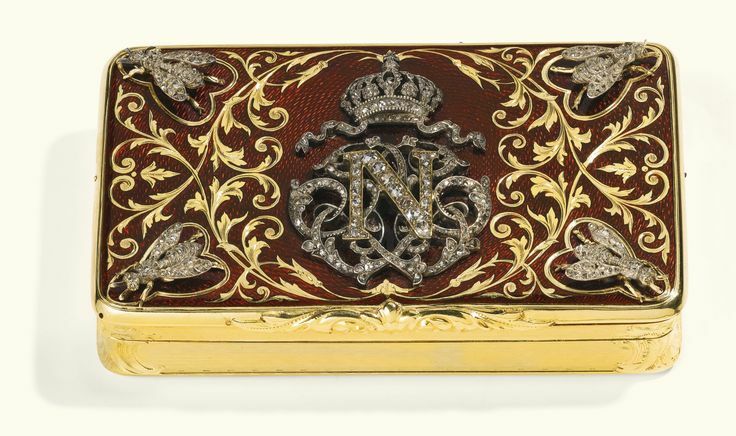 A presentation snuff box with the cypher of Napoleon III. Made by Louis-François Tronquoy, Paris, circa 1855-1871. Est. £15,000-20,000 (€19,200-25,500). Photo Sotheby’s. This jewelled, gold and enamel imperial box was made by LouisFrançois Tronquoy, a prolific snuff box maker and the chief supplier of presentation boxes to Napoleon III. Featuring the cypher of the Emperor of the French, it is further applied with rose-diamond bees. Symbol of immortality and resurrection, the bee was chosen by Napoleon I to link the new dynasty to the very origins of France and was subsequently adopted by Napoleon III. 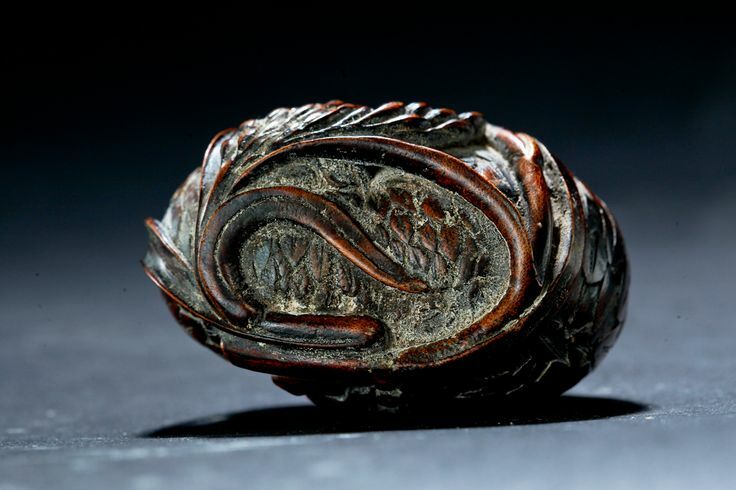 A snuff-box with the cypher of Emperor Maximilian of Mexico’s, circa 1865. Est. £5,000-7,000 (€6,400-9,000). Photo Sotheby’s. 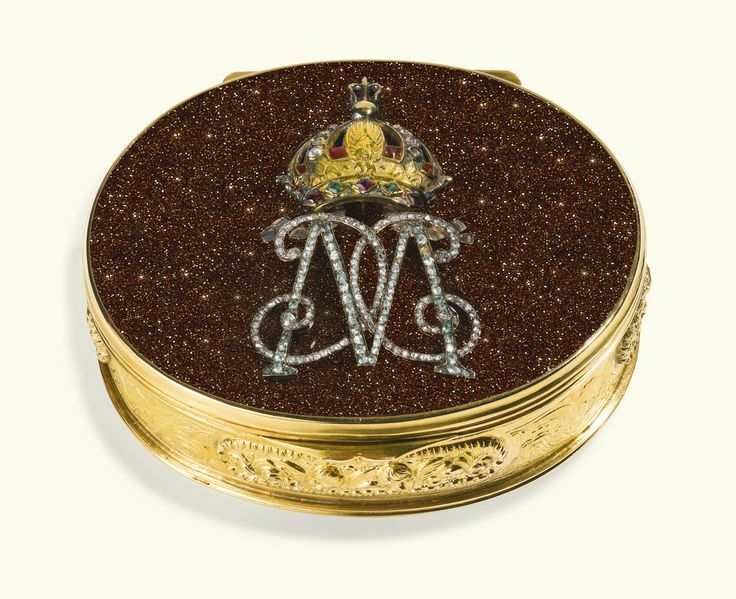 The brown aventurine quartz lid of the box is applied with the emerald and diamond-set enamelled crowned cypher of Emperor Maximilian and his consort Carlota. Archduke Maximilian (1832-1867) was the younger brother of the Austrian emperor Franz Joseph I. In 1861 Maximilian entered into a scheme with Napoleon III to rule Mexico after France captured Mexico City. He declared himself Emperor of Mexico on 10 April 1864 but was captured and executed by the Mexican Republican forces in 1867. 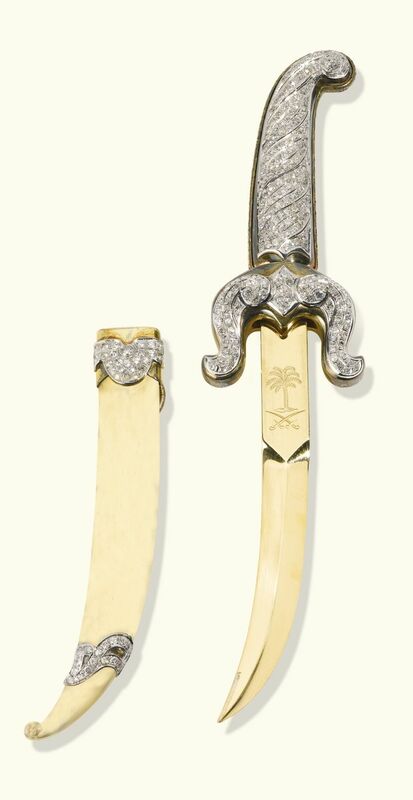 A presentation dagger commissioned by the Saudi Royal family, 20th century. Est. £8,000-12,000 (€7,700-11,200). Photo Sotheby’s. 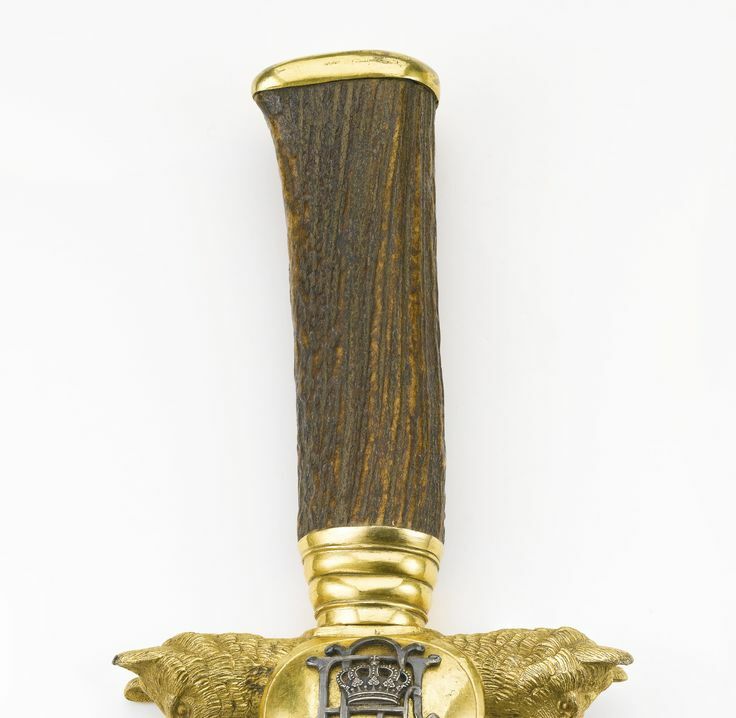 From the same collection as the previous two pieces is a jewelled gold, silver and silvergilt dagger, the blade of which is engraved with the emblem of the Kingdom of Saudi Arabia. The surtout de table of Marquesses of Ormonde, circa 1805. Attributed to Rundell, Bridge & Rundell, possibly supplied by Alexis De Caix. Est. £8,000-12,000 (€10,200-15,300). Photo Sotheby’s. This gilt-bronze surtout de table was most probably made for Kilkenny Castle, Ireland, the seat of Walter Butler, 1st Marquess of Ormonde, 18th Earl of Ormonde and his wife Anna Maria Catherine Clarke. 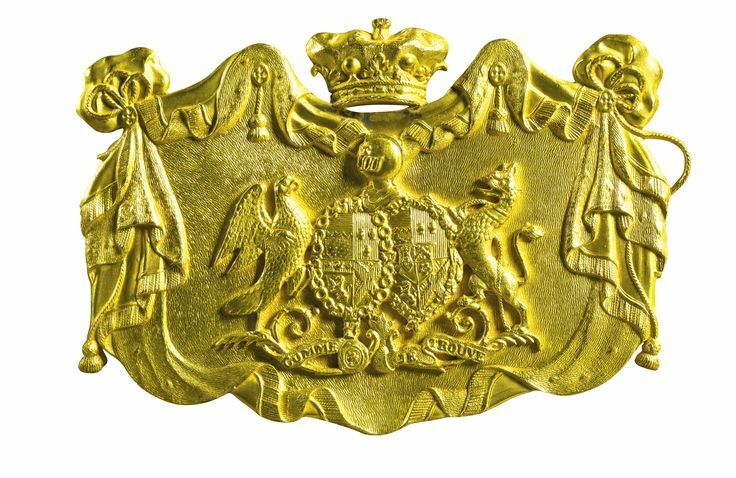 Attributed to Rundell, Bridge & Rundell, foremost Royal goldsmith known to have produced outstanding pieces in bronze, this magnificent piece was designed in the French Empire taste in vogue among the fashionable Regency circles. 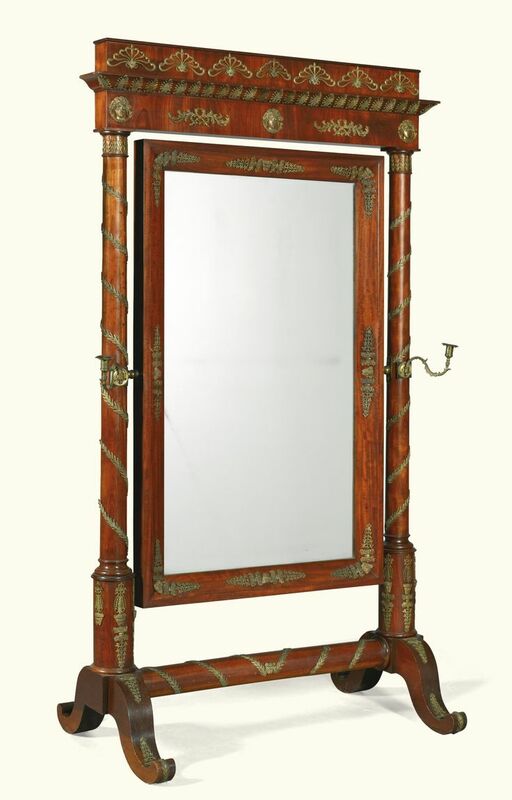 The Empress of Brazil’s mirror, circa 1840. Attributed to Pierre Barthélemy Dejante. Est. £2,000-3,000 (€2,550-3,850). Photo Sotheby’s. Carrying a label with the Brazilian Imperial crown, this Portuguese kingwood gilt bronze mounted cheval mirror in the Empire style is thought to have been supplied to Amélie of Leuchtenberg, Duchess of Braganza, Empress of Brazil (1812-1873) when she was living in Palácio Alvor in Lisbon, as the widow of Dom Pedro, Emperor of Brazil. This exquisite piece is attributed to Pierre Bartholomé Dejante, a Parisian trained cabinetmaker who settled in Lisbon in 1821 and quickly gained a firm reputation in the city. His work was appreciated by the Royal Family who kept commissioning him furnishings for the Palácio de Belém, Palácio da Pena and Palácio das Necessidades, several of which still remain in these palaces. Amélie of Leuchtenberg was Duchess of Leuchtenberg and Empress of Brazil as the wife of Dom Pedro I of Brazil, IV of Portugal. Granddaughter of Josephine de Beauharnais, Empress of the French, she was the daughter of Eugène de Beauharnais and Augusta Amélia, daughter of Maximilian I, King of Bavaria. 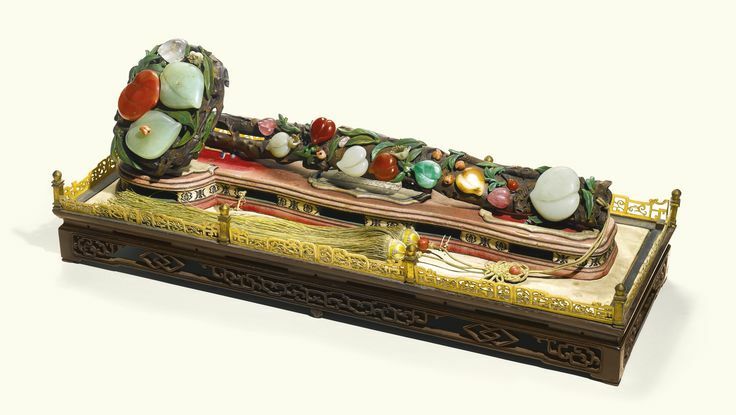 A hardstone, coral and ivory-inlaid wood ruyi sceptre, Qing Dynasty, Guangxu Period. Estimate 30,000 — 50,000 GBP. Lot 65 sold 40,000 GBP. Photo Sotheby’s. 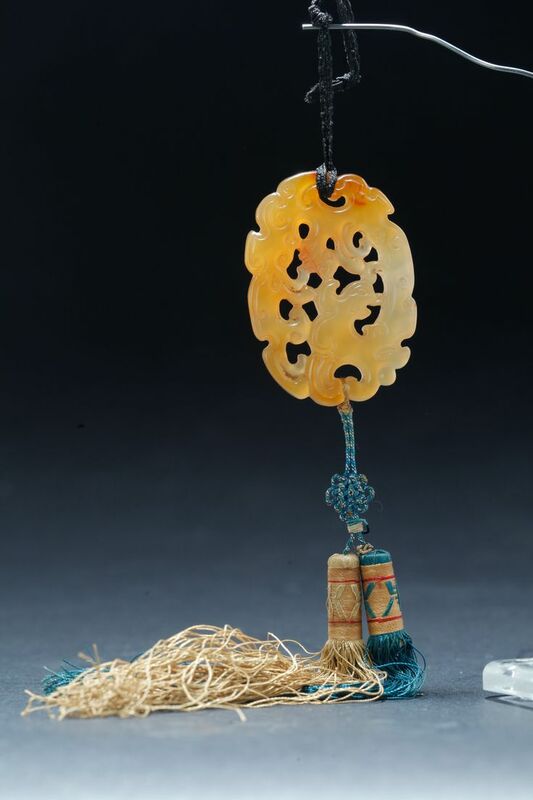 the curved knotted shaft terminating to a lingzhi head, inlaid with jade, jadeite, agate, rose quartz, rock crystal, stained ivory and coral, depicting fruiting leafy sprays of peach, the rectangular stand with balustrades and reticulated ivory fence and a shaped textile support bearing an inscription meaning Presented by Gang Yi (1837-1900), who was the Governor of Guangdong during Guangxu period, glass case. Quantity: 3 – 50.5cm., 19 7/8 in. 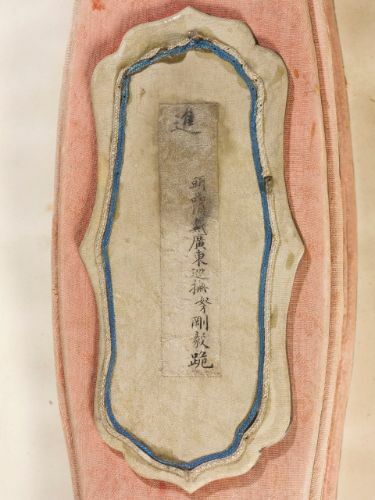 Inscription on stand, which can be translated as ‘Presented by Gang Yi (1837-1900), the Governor of Guangdong during Guangxu period‘. PROVENANCE: According to family tradition directly acquired by a member of the Brockholst Livingston family – the famous Revolutionary War officer Henry Brockholst Livingston (1757 -1823) being the family father – during a visit to China in 1863 and thence by descent to the present owner. inset with ruby cabochon eyes, the finely carved dragon head to the sixty finely carved scale back links. 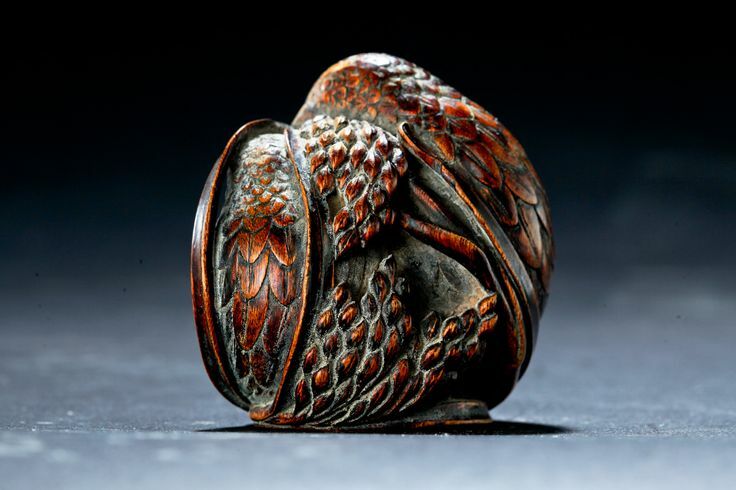 Chinese aloe wood carving of birds, Qing Dynasty (1644-1911). Estimate $ 6,800-7,800. ©Garth’s Auctions, Inc. – Auctioneers & Appraisers. 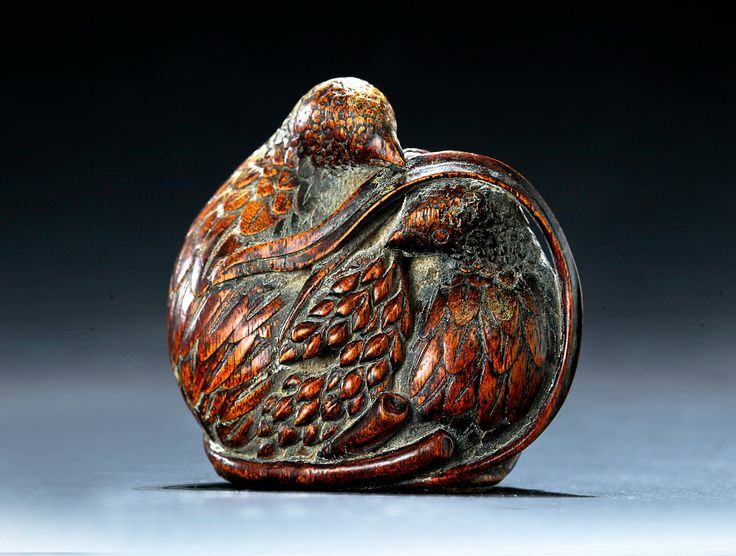 Fine carving of a pair of birds facing each other with reeds in their beaks. 3″h. 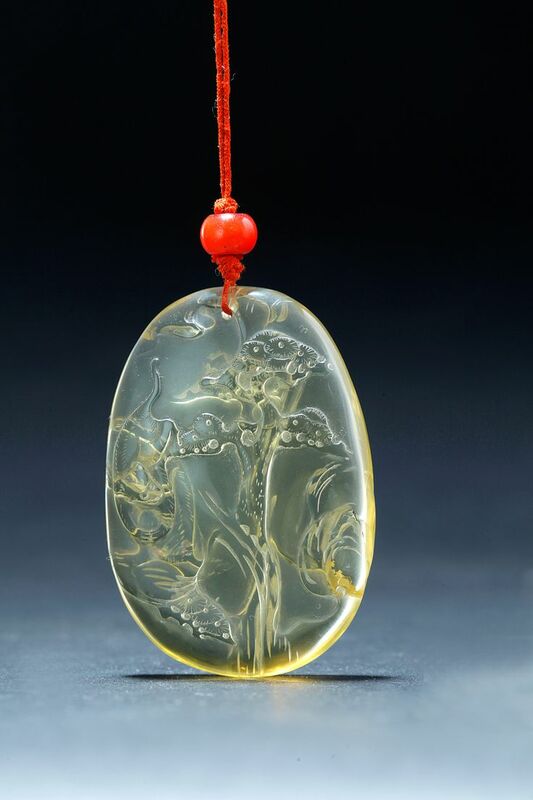 Chinese agate dragon pendant, 18th-19th century. Estimate $ 2,500-3,500. ©Garth’s Auctions, Inc. – Auctioneers & Appraisers. 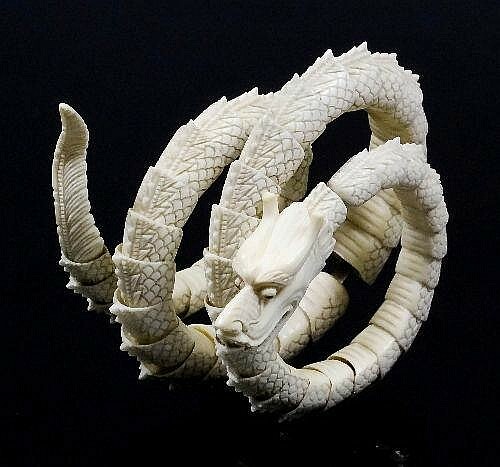 Openwork carving, pair of dragons on each side. 2″h. Silk string. Provenance: from a private California collection. Chinese yellow tourmaline pendant, 19th century. Estimate $ 3,500-4,500. ©Garth’s Auctions, Inc. – Auctioneers & Appraisers. Finely carved monkeys in pine tree branches on both sides. 2.5″l. String with small coral bead.